Forget the Oven and the Stovetop! 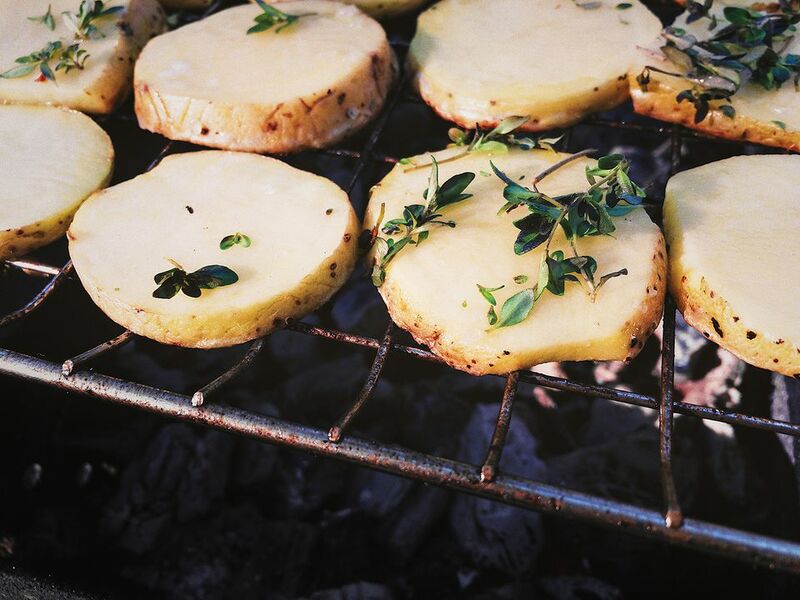 We may automatically think of baking or boiling when it comes to potatoes, but they are actually perfect for the grill. Dense and able to take some punishment, potatoes are the most versatile vegetable—and luckily there are many ways to grill them. From grilled potato skins to grilled potato chips, these fan-favorite dishes can take on a whole new personality on the grill​ and are perfect when it's too hot to cook in the kitchen. The great thing about potatoes is that they are flexible when it comes to cooking time—ideal for a hot and fast trip on the grill or a low and slow bake in the smoker. Just be sure to keep the skins oiled and you will have potato perfection. 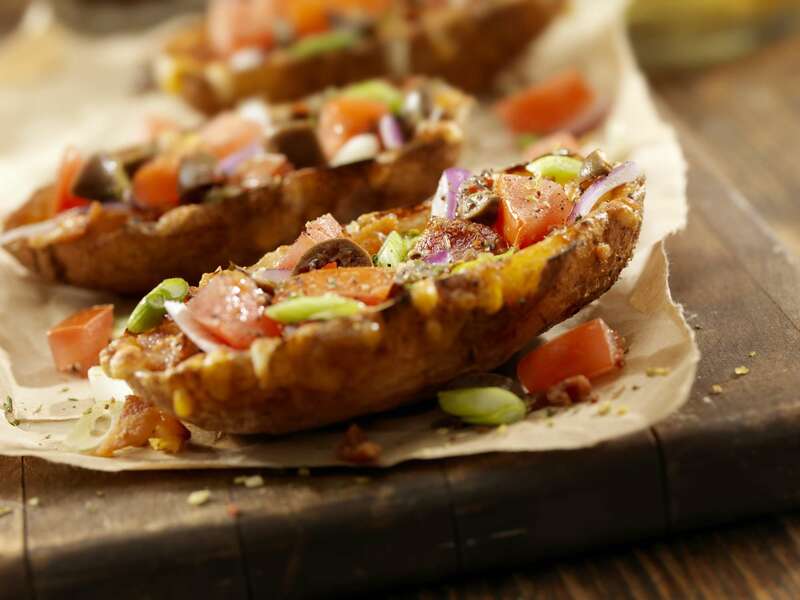 Potato skins are often a crowd favorite when enjoying some apps at the local bar or restaurant, but are also great to make at home. This quick and easy recipe is perfect for summer barbecues or Super Bowl parties since they can be prepared ahead of time and thrown on the grill right before being served. The toppings called for are Cheddar cheese, sour cream, and bacon, but feel free to add some of your own. Grilling food in a foil packet is easy, often healthy, and a cinch to clean up. If you like dill potatoes, you will love this version on the grill. New potatoes cook slowly in a mixture of olive oil, melted butter, garlic, and dill to become creamy with a bit of crispiness on the outside. They will compliment just about any meat, perfect for your next cookout. Another delicious foil packet potato recipe, these grilled potatoes are tossed in a seasoned olive oil and then finished off with tangy Parmesan cheese, giving them a bit of zing and adding a touch of creaminess. They are an easy side dish for any grilled meal and go especially well with a juicy steak. There’s no reason not to cook the entire meal on the grill this summer! This delicious potato “au gratin” is layered with cheese, bacon, and bell pepper, adding great color and texture to the dish. But the comments you'll get from your guests, as well as the minimal prep and clean up, might be the best things about making this dish. We've heard of kettle chips and oven-baked chips, but grilled chips? Once you taste these thinly sliced potatoes with that smoky grilled taste this may be the only way you will eat them from now on. (Since the potatoes are sliced so thin, you do need to use a grill pan or grill basket.) Serve with a lemon garlic aioli on the side for the perfect summer party starter. Another example of the beauty of cooking potatoes on the grill in a foil pouch, these garlic potatoes are great tasting and very easy to make. You can prep the grill packets and place them on the grill while you prepare the rest of the meal. A mixture of garlic, shallots, Dijon mustard, lemon juice, and herbs meld together while cooking the potatoes to a creamy texture. A bit of a decadent side dish, these potatoes are coated in bacon fat and then rolled in a garlic-herb mix before being placed in the smoker or on the grill. The trick to these potatoes is to cook them low and slow, making them perfect for the smoker, but just as easily done on a grill at a low temperature. You can wrap in foil after an hour and continue cooking, or simply continue to roast without for a crispier skin. Serve these potato dippers as a side dish or a fun appetizer at your next gathering. The recipe couldn't be easier—all you need are potatoes cut into wedges, olive oil, and salt. Then grill until there are beautiful grill marks on the outside and the interior is soft and tender. Serve with your favorite dip. Kabobs are a great way to cook vegetables on the grill and although potatoes aren't usually slid onto the skewers, they should be! The potatoes do need to be simmered on the stove first so they cook at the same pace as the other vegetables, but once you taste them drizzled with the herb butter you will see the extra step is worth it. Here’s a dish that combines two summertime favorites—grilling and potato salad—into one! Microwaving the potatoes first saves time and prevents you from turning on the oven in the summer heat. Throwing the potatoes on the grill adds a smoky flavor before tossing with cherry tomatoes, fresh basil, Parmesan cheese, and pine nuts. How Do You Make Grilled Dill Potato Packets?